The Viaduc de l'A6 consists of two parallel prestressed box girder bridges (between the Viaduc l'Quarantaine and the Pont Kitchener Marchand) that extends beyond both sides of the river before disappearing into tunnels (see Google earth photo from the previous week's blog). The river crossings are supported on wide, downward tapering piers. There is surprisingly little written about this haunched girder bridge (built in 1971). Structurae reports that the river spans are 30.9m - 60.0m - 30.9m and that it was built by SGE Societe Generale de entreprises and renovated by Campenon Bernard with prestressing by Fressinet. Perhaps one shouldn't expect to learn much about a bridge with such a prosaic name. In the photo above, we can see that there is a discontinuity between the soffits and the substructures. 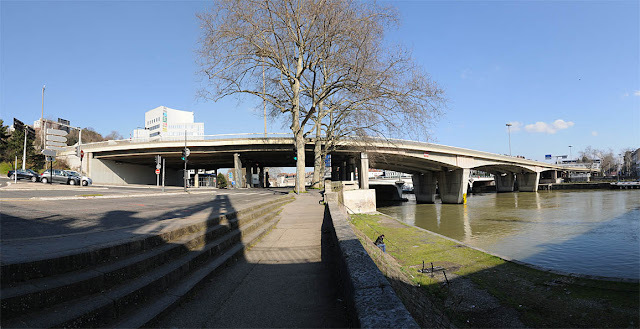 Bridges in Lyon always seem to have the superstructure separate from the substructure (except for the arch bridges). I wonder if the soffit openings (in the photo above) are from the renovation? The bridge has attractive haunched girders and flared pier walls, however, the approach spans are decidedly less attractive (photo below courtesy of Daniel F Valot).